The lights are back on the tallest skyscraper in Downtown Dallas after the big relighting ceremony Thursday night. The Bank of America Plaza has 9,000 feet of new high-powered LED lighting, "known for their brightness, durability and energy efficiency." The iconic green lighting system prior to the update was supplies by argon gas, and would only shine in one color. The new LED lights are capable of 256 million color combination. Thursday night, starting at 6:30 p.m., the Bank of America Plaza returned to its signature green glow. There was also a 20-minute show of the new LED system that showcased what the new lights can do for the skyline depending on the occasion. The tallest skyscraper in Dallas will light up in green after the building lights were restored with new high-power LED lighting. Dallas Mayor Mike Rawlings presided over the official relighting ceremony. Rawlings told NBC 5, with the light displays shown nightly on the Omni Hotel and Reunion Tower, he hopes the Bank of America Plaza lighting becomes just the latest example of a growing trend. "You know, I'll tell you, we're not gonna be Vegas," Rawlings said. "[But we are] gonna be 2020, OK? We're gonna be out there. And we wanna be pushing it. And I think all the LED technology now brings a little excitement." 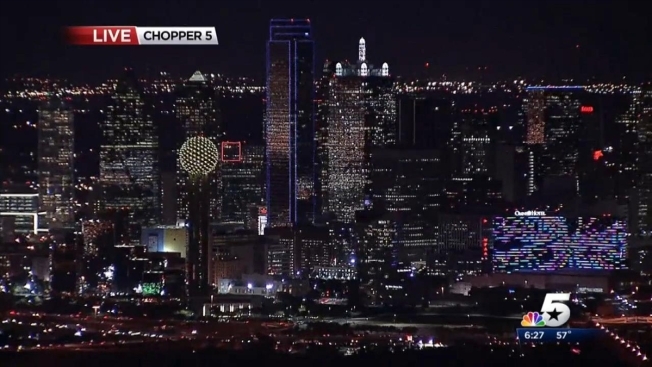 Chopper 5 saw the light return to the 72-story Bank of America Plaza building Wednesday night, with a variety of colors changing from red to green and blue. The office tower opened in 1985 and has been getting a $15 million renovation. Interior renovations are expected to be finished by May 2014.